Extra 10% Off Kids Clearance Bikes at Cycle Surgery Shop the kids bike sale now at Cycle Surgery and get an amazing extra 10% off! Extra 20% Off Gloves and Mitts at Cycle Surgery Head over to Cycle Surgery for your cycling essentials. Get 20% off gloves and mitts today. Up to 50% Off Clearance Items at Cycle Surgery Don't miss out on the Cycle Surgery sale and save a huge 50% off selected items! Free Shipping on Orders Over £50 at Cycle Surgery Don't pay the extra for delivery at Cycle Surgery when you spend over £50! Up to 45% Off Mountain Bikes at Cycle Surgery If you're looking to cycle further and explore the great outdoors then head to the Cycle Surgery clearance sale for huge discounts on Mountain bikes. Up to 70% Off Clothing in the Sale at Cycle Surgery Shop the sale for reductions on clothing and more at Cycle Surgery! Up to 70% Off Components Sale Items at Cycle Surgery Shop these absolute bargains now in the clearance! Up to 70% Off Accessories Sale Items at Cycle Surgery You can get up to 70% off cycling accessories in the Cycle Surgery clearance! 70% Off Selected Footwear at Cycle Surgery-Clearance Sale! Don't miss the final reductions at Cycle Surgery including footwear, clothing and more! Since 1992 when Cycle Surgery was created in an Islington basement, the team has been focusing on people's commitment to riding bikes and trying to figure out just why we ride. This is the secret to their craftsmanship and devotion to delivering epic products and services. Whether you cycle to beat the transport system on your daily commute, or whether you are a thrill chaser and simply love the outdoors - here you will be able to fuel your bicycle passion and see how there are no limits to your ride anymore. The Cycle Surgery is where to kit yourself out for good, so that you can be on top form, every ride. With tonnes of inspiration and advice online, now you can get the guidance and support you need to suit your journey. For the mountain biker, road rider and more - from the bike, accessories and your protective gear, to maintenance and other items to help you outshine in your performance - prepare to be wowed at Cycle Surgery. Here you are with the experts and you won't pay through the nose either with their nifty price promise - because after all, happiness and your safety is priceless. How do I use my Cycle Surgery discount code? Click ‘confirm code’ for your savings to be applied and click ‘checkout’ to continue and complete the transaction. 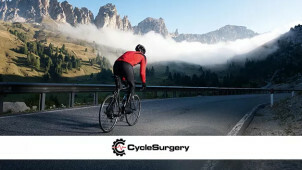 Sign up to the newsletter with your email address and let Cycle Surgery keep you updated with news and great offers! Where is my nearest Cycle Surgery? You will find a store locator online, at the bottom of each page. Enter your location to find a Cycle Surgery near you. Does Cycle Surgery offer student discount? While there may not be a student discount available all year round, you will always find other great offers for Cycle Surgery at vouchercloud. Does Cycle Surgery have gift cards? The gift of a bike is a dream for many, and now you can let your receiver choose quality performance attire or equipment when you gift a Gift Card. You can load them up with up to £500 credit and they are valid for 12 months from purchase. Can I pay for my bike on finance? A bike is a big investment and the interest-free finance option at Cycle Surgery lets you spread the cost of your new bike or frame over a 6, 9 or 12 month period. You will just have to make an initial 10% deposit and you're off, see here for more details. You can return items to one of the 30+ Cycle Surgery stores with your receipt and a completed returns form that came with your order. Visit here for more options and to contact the Help Centre 24/7. At times, the environmentally-friendly and healthy alternative to other forms of transports can wind up being a little pricey. With a Cycle Surgery discount code you’ll be able to shop a wide variety of bikes, clothing, footwear, bike parts and other important cycling accessories for less. So if you’re a keen cyclist, or on the road to becoming one - you can get all the equipment, accessories and apparel that you need to keep you safe and secure on the road. At the Cycle Surgery, you can get involved in the Cycle to Work Scheme which has some incredible benefits for your health as well as for your pocket! If your employer decides to sign up to it, then they can buy up to £1000 worth of bike gear for you, and you'll pay them back at a cheaper rate and over a 12-18 month period. By the money coming out of your gross salary - untouched by the tax man - you’ll save on at least 25% of the cost outright. Lots of us cycle to work here at vouchercloud, and as you may already be aware - safety always comes first! The clothing accessories range at the Cycle Surgery is a world of great items to keep you protected, comfortable and visible. With a Cycle Surgery voucher you can shop all the gear you need so that no matter what time of year, and whatever the weather - you can reap all the benefits and enjoyment of getting on your bike - be it for a weekend away or even for that humdrum commute!